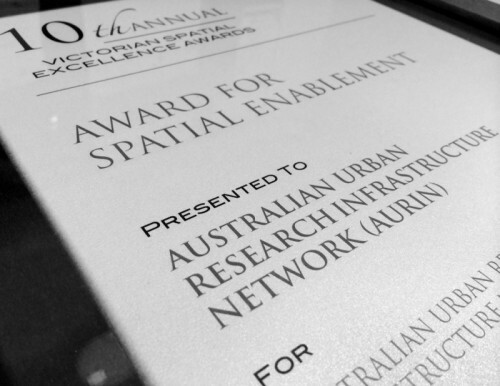 AURIN was announced as the winner of the Spatial Enablement award at the 10th Annual Victorian Spatial Excellence Awards at a gala dinner in Melbourne on 25th September 2014. Judges of the award commented that AURIN embodied spatial enabled by creating an open-source platform that places extensive spatial datasets and powerful analytical tools in the hands of urban research, planners and decision makers. AURIN congratulates this year’s winners and finalists of the Victorian Spatial Excellence Awards, including Mr Phillip Delaney (previosuly of AURIN), who received the Young Professional of the Year Award.